The Yamaha R3 is without doubt the garage queen of the ZigWheels motorcycle long term fleet. The supersports inspired styling, twin-cylinder powerplant and the works make it an enticing motorcycle. I had spent few weeks with the Yamaha R3 before handing over the keys to Ravi. But with a long weekend popping up in the calendar a ride was something that was inevitable. Our video editor, Amar, also joined me for the trip aboard the Mahindra Mojo and the destination was unsurprisingly – Goa. But before heading on the road, the Yamaha R3 had to be serviced and I must admit that the staffs at the service centre was very prompt and within few hours the bike was gleaming under the afternoon sunlight for the ride. We took the Kholapur-Nipani route instead of the popular NH17 so as to reach our destination earlier. Being a long weekend we faced dense traffic till the outskirts of Pune and once we were past it, an empty patch of highway was our only companion. It was the perfect setting for the Yamaha R3 to stretch its legs and boy was the bike happy. Doing triple digit speeds on the Yamaha R3 is an effortless affair and the bike can cruise at speeds of around 130kmph all day long, something which we at ZigWheels wouldn’t advice our readers to do on our terrific roadways. The gearing of the R3 is nicely distributed with the 6th cog working as an overdrive. The parallel-twin motor is also very tractable which meant overtaking on the highway was a breeze and one doesn’t have to down shift to extract the juice from the engine. The 6-speed gearbox works with the precision of a Swiss made watch while the refinement of the engine is among the best in the segment with only minor vibes in the top end of the revv range. After the highway stretch was over, it was time for the ghats and to have some fun on the Yamaha R3. But there’s a catch, despite the wonderfully communicative chassis there’s a chink in the R3’s armour and it’s the tyre. The MRF tyres feel terribly out of place on the Yamaha R3 and despite the potential of the motorcycle, the rider doesn’t get the confidence of pushing the bike in the corners. So if you have purchased a R3 or plan to buy one please get the tyres upgraded to Pirelli or Metzeler. Also the lack of ABS at this price point is a bit disappointing as the rear tyre has a tendency to fishtail under hard braking. Ride quality of the bike is decent and luckily for us we only encountered few bad patches of tarmac in our road trip. 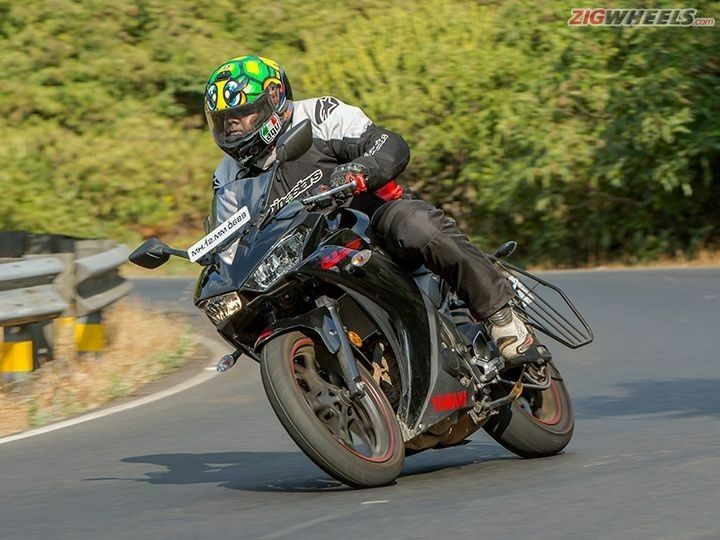 Despite being a full faired offering, the Yamaha R3 is impressive with respect to agility as we found out on the tourist infested roads of Baga and Calangute. Another interesting aspect was the fact that the Mahindra Mojo grabbed more eyeballs than the Yamaha R3 and this could be blamed to the rather dull black shade on our long term bike as it looks smashing in the blue and silver shade. The riding posture of the Yamaha R3 isn’t very aggressive as say like the R15 and this can be credited to the raised clip-on handlebars. This means one doesn’t get fatigued despite riding for long distance. So is the Yamaha R3 a great option for touring? Well not really, it’s a decent bike but not the best. As there aren’t provisions for clamping bungee cords, the stock headlamps aren’t bright enough and the thinly padded seat isn’t bum friendly. Overall as a motorcycle I had loads of fun on the Yamaha R3 during my ride barring a few hiccups that can be easily fixed.